The recent Palm PVG100 reveal has thrust a few new details about the Palm brand relaunch out into the wild. One of the more curious points to arise is the name of company that is making the actual fillings called Palm Ventures Group. As of publication, Palm Ventures Group has zero web presence and very few mentions on the web other than in the recent FCC and WiFi Alliance regulatory fillings. The new fillings go on to reveal the company cofounders and well as a potential new Palm brand logo. The name Palm Ventures Group had been previously used by Palm Inc. In September of 2000 a newly public Palm Inc. created Palm Ventures, an organization designed to make strategic investments in companies in the "Palm Economy" such as software developers and accessory makers and other solution providers. The group initially started with a $50 million fund, which mostly came from the proceeds of Palm's record breaking IPO debut. It's not clear how long this group operated but surely ceased long ago. Rumors first started circulating about a year ago that TCL, the current owners of the Palm brand, were aiming to bring the brand back in 2018. China based TCL makes a broad range of electronics under various brand names around the world including products make under the revived BlackBerry brand. TCL has little to zero connection to the Palm of old and acquired the rights to the Palm brand in a deal with HP made in 2015. 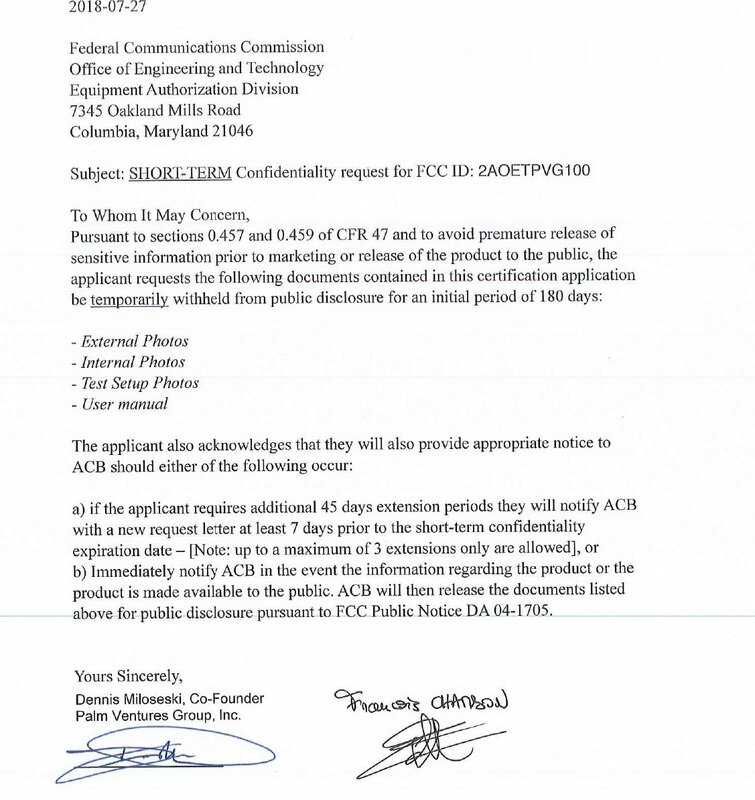 In the new FCC documents numerous mentions are made of Palm Ventures Group listing them as the primary applicant. A possible device label also prominently lists Palm Ventures Group as the top billing on the regulatory label of the presumed new Palm PVG100 device. This label also includes the phrase "Designed by Palm in San Francisco" that Palm Inc began using in the late 2000's in obvious homage to Apple. The parallels seem clear that Palm Ventures Group is working on a new Palm device. In the FCC letters Palm Ventures Groups lists its cofounder as Dennis Miloseski. According to his personal bio, Mr. Miloseski is a former VP of Design and R&D for Samsung's Design America office and prior he also spent time as a Head of Design at Google. At Samsung his team worked on projects creating the Samsung Gear Fit 1 & 2, Gear S & S2, Gear IconX, Gear Circle, Samsung Galaxy View, and the Samsung Level Headphone Line-up. The FCC documents also list a second cofounder. Unfortunately this persons name is not entirely legible in the signed documents as you can see in the image of the letter below. Full Palm Ventures Group FCC letter image.